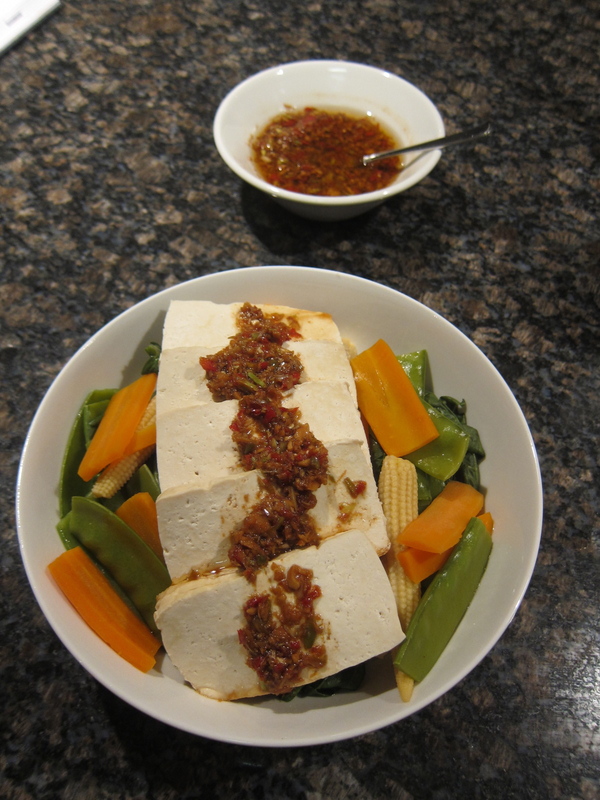 I’m not a huge tofu fan – but I thought I’d try this dish while the man of the house is away on a conference. He is less than complimentary about tofu! I certainly eat it – and I have – especially the amazing fried tofu dish at Longrain – but it’s not something that I have ever – ever bought at the supermarket. This is a colourful, healthy and easy to put together dish and it can be ready in half an hour, so it’s great for families. Having said that, I don’t know that Master 4 would go for this one – and I certainly didn’t try him on it last night. He’s still finding his palate especially for spicy or hot dishes, so I’m slowly turning up the volume on the spices I use in our every day meals. The preparation of the sauce could not be easier. Some coriander roots, ginger, garlic, spring onion, chilli, soy sauce, brown rice vinegar, sesame oil and peanut oil. 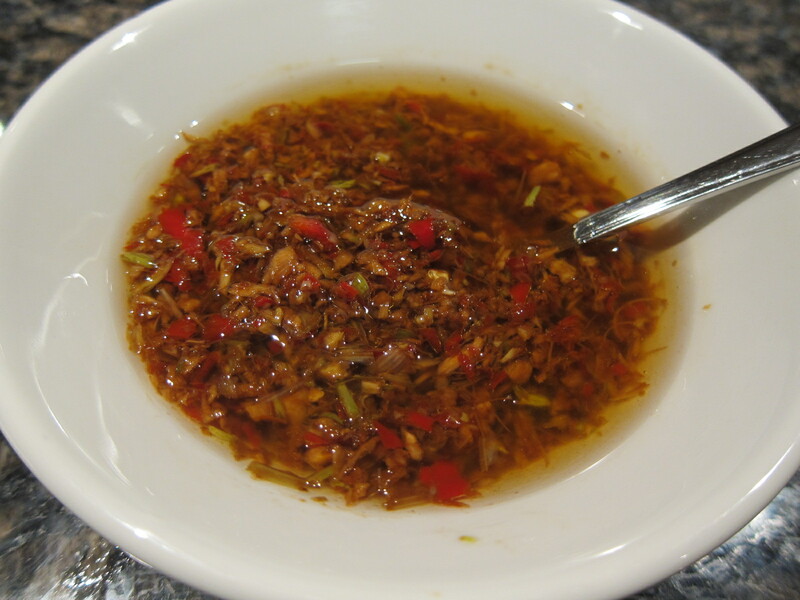 I was supremely lazy and didn’t even rinse out the bowl after I’d made the sauce and then heated the oil, thinking that any bits of flavour would be absorbed by the rice in the cooking process, which it was. So this dish is a cracker in terms of cleaning up as there’s hardly any! The only time consuming part – if you could possibly call it that – is the preparation of your vegetables. I followed the recipe, using carrot, bok choi, and baby corn but noticed in the picture that there was something that looked suspiciously like snow peas in the bowl, but they weren’t mentioned in the ingredient list. Being a snow pea fan I bought some to throw in. Of course, you could use whatever vegetables you have in the fridge, so there are no hard and fast rules. So how was it? To be honest, it was ok. I’m not sure I’d make it again. I thought the rice was a little too overdone, and the vegetables were a bit past their best after being steamed for 10 minutes. So if I were to do it again, I’d play around with the timing a little and probably only steam the vegetables for 6 or so minutes, and reduce the cooking time of the rice to a bit less so it was a little more bitey. I’d probably also cut the tofu into much smaller bits and I’d be inclined to toss the sauce through the veggies, tofu and rice – which may not look as nice for the presentation, but would probably make the dish a little more flavoursome. I think brown rice would also be much tastier in this recipe, but of course it would drag out your cooking time another 20 minutes or so. I’m not sure if I’m being completely ridiculous on this one or not – but I thought this dish would also be great with some noodles and a light broth or stock for the tofu and vegetables to swim around it a bit. Hmmm, food for thought, I’d might just try that out! I now salt and then fry the tofu – crispy outside and really tasty.